It has been more than 10 days since Malaysia Airlines flight MH370, a 777-200ER, deviated from its intended route during a flight from Kuala Lumpur, Malaysia to Beijing, China. Since then, no trace of the aircraft has been found, and the fate of the 227 passengers and 12 crew members is unknown. Some of the circumstances around the disappearance of the aircraft, especially the lack of any communication from the aircraft after it radically changed course, has led to speculation in the media and elsewhere about why the aircraft went missing. Although there is currently no physical evidence from the aircraft or data from the cockpit voice recorder and flight data recorder (the black boxes) that can help investigators and the public understand what happened and why it happened, there is a substantial amount of other information, including radar data and data relayed from the aircraft to a satellite, that provide insights into the general kinds of situations that the crew may have had to deal with. The investigation into the disappearance of the flight is still in the earliest phases, but that has not prevented the media and the public from speculating about what happened to the flight. While many possible scenarios have been put forth by the public and the media, some are much more plausible given the available evidence. Based on that evidence and a comparison with a number of past accidents, incidents, and acts of sabotage or hijacking; the following four scenarios are consistent with what is known about the behavior of the flight. Hijacking not involving the crew - One or more of the passengers hijacked the plane against the wishes of the flight crew and cabin crew. Hijacking involving the crew - One or more flight crew or cabin crew members hijacked the plane, possibly with the help of one or more hijackers from among the passengers. An extraordinary situation involving one or more aircraft systems - The deviations from the expected route and departures from normal procedures, including turning off transponders and other systems, could have been done by the crew in order to deal with a situation that put the aircraft at extreme risk. It is very likely in such a situation that a crew would exercise both initiative and creativity and take whatever steps were necessary, including disengaging, reconfiguring, or shutting down numerous systems, in order to maintain control of the aircraft. Inaction from the crew - The 777 has a complex flight control system that in some circumstances may be able to keep the aircraft in controlled flight without further input from the crew, even if no specific flight plan had been programmed by the crew, until the jet's fuel is exhausted. It is possible that none of these general scenarios explain what happened. 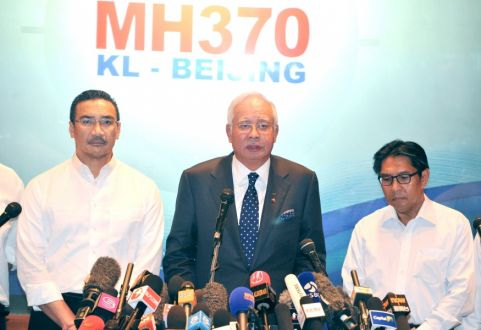 It is also possible that flight MH370 went through two or more of these scenarios, such as a hijacking followed by extraordinary attempts to regain control of the aircraft. Should additional information, specifically the information from the black boxes, become available, that information will likely clarify what actually took place. Why would the crew not communicate with ATC? Pilots, no matter what kind of aircraft they may be flying, are taught to have three general priorities in an emergency. The first is to aviate, or to maintain control of the aircraft. The second is to navigate, which is to determine both one's location and intended flight path. The least important of these three priorities is to communicate, or to let someone else, including air traffic controllers or the cabin crew, know your plans or your needs. The fact that the crew did not speak to air traffic controllers or to other aircraft after deviating from their flight plan could be do to many causes, including malfunctioning communications equipment or because they were not allowed to do so. It is also conceivable that there were attempts to communicate, but that no one heard them. What is needed to understand this event Ideally, if the aircraft is recovered intact, and all of the crew and passengers are alive, there will be plenty of evidence from witness statements, black box data, and even from the personal electronic devices of passengers, and this evidence will likely answer all of the key questions surrounding this flight. However, even this ideal scenario won't include all of the relevant data because the cockpit voice recorder only records roughly the last two hours of cockpit conversations and radio communications, so there would be no recorded cockpit conversations from the early phases of the flight when the aircraft deviated from its flight plan. If there are no crew or passengers available for interviews, it may become very important for the investigating authorities to recover as many potential recording devices such as tablets and mobile phones that may have been carried by passengers and crew members. These devices may provide direct or indirect evidence of what went on during the course of the flight. to bare as rejection is a force sometimes too powerfull for an honorable man who has lost everything to continue living. God bless those on board and their families.